Yeah, I know Most of you guys don’t care about the BlackBerry Javelin but it really isn’t all that bad. A member of Howard Forums have leaked these images of a size comparison of the Javelin, Curve, and 8800. Surprisingly, the Javelin is the smallest. That’s something to look forward! Here’s just a recap of the Javelin’s features. The BlackBerry Javelin will come equipped withÂ Wi-Fi and GPS but unfortunately no 3G. Other notable features are 3.2 megapixels camera, bigger display, O.S 4.6, and more spaced out keys. What do you think about this? Since the Bold has been released in other countries already. By the time we get a release date for the U.S. do you think it will be delayed again? 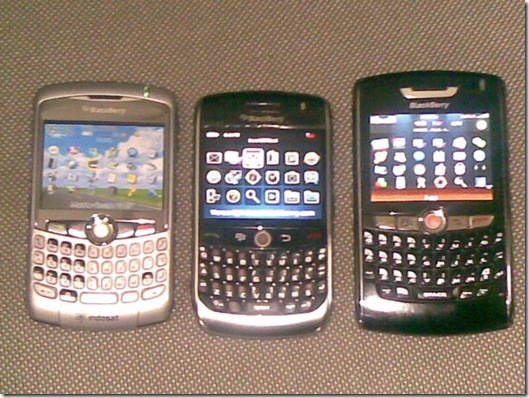 I’m almost wondering if the BlackBerry Javelin will come out before the Bold?